I have a Jack Russell and she loves to sleep under the covers. Is this common for her breed? She will be 7 in June and has done this since we got her as a puppy. Also, she has to be touching me or my husband at all times while she's sleeping too. I too have a Jack named Riley and she sleeps with me or my daughter under the covers. She will nudge you until you let her in or on occasion I have found her on my pillow. I can't get her out of my bed, hard when you have a cute little puppy! My China will soon be 11 years old and has LOVED sleeping with her baby blankets since we got her at age 8 weeks! The more the better. She seems to feel safer tucked away under her pile of blankets so it must be a JRT thing. When she comes to bed, she's also got to be under the covers and some part of her...usually a pointed foot....has to be touching. It's okay until she starts dreaming and running in her sleep!!! OUCH!! Isn't that hilarious? Does that happen with Riley? Oh well, just another JRT quirk, I guess. 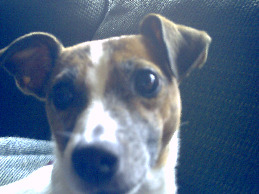 I have a JRT that will be 1 yr old on the 31st of this month. She does the same thing. When I go to bed under the covers she goes, and is right next to me, if I turn over during the night she changes sides because she usually sleeps in the crook of my legs. She is also very attached in many others ways as well.